Megan Weaver (Guest Director, Eurydice) is a director specializing in new play development and collaboratively devised work. Megan originally hails from Oregon and earned her BA in theatre from George Fox University. She is a proud alumna of the Eugene O'Neill Theater Center's National Theater Institute, and has trained with The Wooster Group and SITI Company. She is currently an MFA directing candidate at Arizona State University. Recent projects include POVV (prisoner of view/point of war) and American Agency (ASU); Cause of Failure (playwright; FullStop Collective and FringeNYC; published in NYTheater's Best of FringeNYC 2012 collection); Eurydice (George Fox University); The Lover, Notebook and Vaudeville Vanya (O'Neill Theater Center); Unville Brazil (assistant director; New York Innovative Theater Award nomination for Best Musical 2011); and The Push to Mate (FullStop Collective). Megan is a founding member of FullStop Collective, a New York theater collaborative devoted to the development and production of innovative new plays. She has served as artistic director of dramatic productions at Mystic Seaport and an adjunct professor of theater at George Fox University ( meganweaver.com). Caleb Thurston (Guest Director, Doubt) earned his BA in theatre at George Fox University in 2010, focusing on acting and directing. In 2009, his direction of Jim Leonard Jr.'s play The Diviners earned him a commendation from the Kennedy Center American College Theatre Festival. Following graduation, Caleb served as a guest artist at St. Helens High School and at George Fox University, directing Doubt by John Patrick Shanley. Outside of George Fox, his favorite directing credits include Oliver! by Lionel Bart, Blithe Spirit by Noel Coward, and Harvey by Mary Chase. Caleb is the cofounder and former director of River City Children's Theatre, bringing performing arts opportunities to more than 400 students in Columbia County, Oregon. Caleb currently serves as executive director of Valley Repertory Theatre, Newberg's professional theatre company ( valleyrep.org). He is especially proud of VRT's "Stories of Newberg" project that endeavors to bring true, local stories to the stage. Caleb lives in Newberg with his wife, Heidi. Jacob Coleman (Guest Director, Blithe Spirit) is a director, performer, teacher and founding member of the Portland Experimental Theatre Ensemble. Recent performances with PETE include Procedures for Saying No (“Peter”), [ or, the whale] (“Ahab”), Enter THE NIGHT (“Jack”), Three Sisters (“Tuzenbach”) and R3 (“Richard”). Jacob directed PETE’s All Well, Drowned Horse Tavern, and Song of the Dodo and co-directed Opus 3 at the Portland Actors Conservatory. Jacob has also worked in Portland with Shaking The Tree ( A Doll’s House), Imago Theatre ( The Homecoming, The Caretaker), Liminal Performance Group ( The Resurrectory), zoe|juniper ( a crack in everything [installed]), Amber Whitehall ( Near To The Wild Heart, On Killing), and in NYC with Jenny Vogel ( Cruelty of Pirates). Jacob teaches with PETE at the Institute for Contemporary Performance, and at Pacific University. Michelle Seaton (Guest Director, The House of Mernarda Alba) recently moved back to Portland, Oregon, after an eight-year hiatus in New York and New Jersey. During her time there, Michelle received an MFA in directing from Mason Gross School of the Arts at Rutgers University. In addition to her MFA, she founded the New York-based company Dark Luna Productions, where she directed numerous productions, including off-off Broadway's Passage and Us vs. Them (which she also acted in). Some other NY/NJ directing credits include Egyptology, Walking Shadows, Cloud Tectonics, Voir Dire, Dog Sees God, Stop Kiss, Wilde Abandon, Rosemary with Ginger, as well as a piece from Lee Blessing's Reading Series and the 7th Inning Stretch at Miles Square Theatre. Prior to graduate school, Michelle was the resident director and actor for Stark Raving Theatre, where she directed Drammy Award-winning ElectroPuss as well as Weeping Woman, Thrust, The Principle and the Pee and Vamp. Other Portland productions include Theatre Vertigo's The Flu Season and In the Air from the 24-Hours Play Series. Some acting credits include "T" in Us vs. Them, "Andromache" in Trojan Women, "Viola" in Twelfth Night, "Aphrodite" in C upid and Psyche, various characters in Frogwoman, "Lenore" in Treatment, "Dora" in the 24-Hour Play, "Janie" in Isn't It Romantic, "Elma" in Bus Stop, "Mary" in Serenading Louie, "Fanny" in DarkStep & Dawning and "Sorel" in Hay Fever. Michelle has worked in theatres such as Ensemble Studio Theatre, St. Louis Repertory, The Eugene O'Neill Center and the American Globe. She teaches acting at the University of Portland and Linfield College. Michelle is a graduate from Portland Actors Conservatory and holds a double BA in theatre and communications from Linfield College. Andy Copeland (Guest Actor, The Balkan Women) is a visiting lecturer of theatre and scene shop manager. He is a graduate from the Portland Actor's Conservatory and has been pursuing acting on stage and film for the past 10 years. He was most recently seen as "Percy Shelley" in Bloody Poetry at Northwest Classical Theater, and "White" in The Sunset Limited at Valley Repertory Theatre. He can also be seen as "Harry" in the web-series Everything Will Be Fine as well as "Mac McGill" in the award-winning short film 271. Matt Tibbs (Sound Designer) is the resident sound designer for Pioneer Theatre Company and adjunct faculty member teaching sound design for the University of Utah. Matthew continues to design for Great River Shakespeare Festival and has worked previously at Portland Center Stage, Artists Repertory Theatre, and Ensemble Theatre of Cincinnati. Matthew's work in film has been seen at the Art Directors' Club, NewFilmmakers New York, The Austin Film Festival, and the Toronto ReelHeART Film Festival, among others. Matthew holds an MFA in sound design from the University of Cincinnati's College-Conservatory of Music (CCM) and a BA from George Fox University. Rich Swingle (Guest Artist, George Fox University Class of '91) has performed on five continents, 25 nations and in hundreds of venues with his one-man plays and workshops. The dynamic nature of his work can fill as little as 10 minutes in a larger presentation or as much as a full week of workshops. He has performed at churches, colleges, retreats, camps, prisons, a military base, theatres from Off-Broadway to The Kennedy Center, film, radio, and CD-ROM. For the "Beginners Bible" video series, distributed by Sony Wonder, he did 20 roles, including Jesus, Adam and the Serpent. He has performed voice-overs and on-screen roles in several commercials and nine movies. He has performed and/or taught workshops in more than 30 colleges or universities, including Namseoul University, Korea, Memphis University, and Princeton. Rich also spoke at the Ivy League Congress on Faith and Action, hosted by the Harvard University chapter of Christian Union. Maggie Daane (Music Director, Into the Woods, Thoroughly Modern Millie and She Loves Me) soprano, is a soloist, teacher, and adjudicator known to audiences and students throughout the Northwest. Her guest artist appearances include those with the Oregon Symphony, Portland Baroque Orchestra, OSU-Corvallis Symphony Orchestra, Choral Arts Ensemble, the Portland Youth Philharmonic, Choral Cross Ties, and the Chehalem Orchestra. She has sung the roles of Mary Ann in New Moon, Dido in Dido and Aneas, Susannah in The Marriage of Figaro, Suor Angelica in Suor Angelica, Gretel in Hansel and Gretel, Nella in Gianni Schcchi, and Baby Doe in The Ballad of Baby Doe. Allison Dawe (Costume Designer, The Taming of the Shrew) is a local-area costume designer and theatrical seamstress. She has designed and worked on productions at Artists Repertory Theatre, Lakewood Theatre, Broadway Rose Theatre Company and Bag and Baggage Productions. Some of her recent costume design credits include Joseph and the Amazing Technicolor Dreamcoat (Broadway Rose Theatre), Macbeth and The Glass Menagerie (Bag and Baggage Productions), and The Hollow and Sweet Charity (The Lakewood Theatre). Allison received a bachelor's degree from Western Washington University's Fairhaven College in costume design and theatrical crafts. Claudie Jean Fisher (Costume Designer, The Crucible, As You Like It, and Eurydice) received her B.S. from the University of Portland. Claudie's recent credits include Speech and Debate and The Clean House (for which she earned a Drammy Award for "Outstanding Costume Design") at Artists Repertory Theatre. Also at Artists Rep, she was the costume design assistant for Vanya, featuring Academy Award winner, William Hurt. Fisher's film credits include Smoke Rings, a short film accepted into the prestigious Santa Barbara International Film Festival's 2010 Silver Anniversary Program, and The Glass Whale, which played in Peripheral Produce's PDX Film Fest in 2008. For Portland Opera, Fisher was the costume design assistant for La Calisto and Albert Herring, as well as the wardrobe manager for Portland Opera To Go's productions of La Boheme and Hansel and Gretel, helping to bring live theatre to students throughout Oregon. Fisher was also the wardrobe manager for Portland State University's production of Cosí fan tutte. For Haven Project, Fisher was a designer and mentor for productions of Gilgamesh and Our Town. As a seamstress, Fishers has worked with Michael Curry Design (on Disney's The Lion King and other productions), Mock's Crest Productions, The Oregon Ballet, Artists Repertory Theatre, and Portland Opera. While earning her degree at the University of Portland, Fisher won the American College Theater Festival's northwest regional award for her Cloud Nine costume deigns, as well as the Best Off-Stage Contribution award for 2000-2001. Fisher is delighted to return to George Fox, where she managed the costume shop in 2003 and designed costumes for As You Like It and The Crucible. Sandra Rocha Kaufman (Costume Designer) made her design debut in Portland Opera's world premiere of Wuthering Heights. Design assignments with numerous theatre and opera companies include Girl of the Golden West, Lohengrin, A Little Night Music, Rigoletto, Amadeus, and the Magic Flute. During her career, she has designed costumes for more than 50 musicals. Favorites are: The Mikado, Tintypes, Brigadoon, Merry Widow, Hello Dolly, and Into The Woods. While she still guest designs whenever the opportunity arises, she is mostly involved in creating garden sculpture, which she sells at art and gift shows and markets throughout the Portland area. Jessica Lynn (Costume Designer, The Diviners) is an alum of the University of Portland, freelance designing in the Portland area. Her credits include 2004 recipient of the Kennedy center's National Barbizon Award for Theatrical Design Excellence in Costumes; Kennedy Center design intensives with Ming Cho Lee and Constance Hoffman; a member of the costume shopt for the 2004-05 season at Shakespeare Theatre Company in Washington D.C.; commercial and music video work with Bent Image Labs in Portland, Oregon; and three years working on puppets for LAIKA Studios on the stop-motion feature length film Coraline, which premiered in February of 2009, making over $120 million in box office worldwide. Megan Marsh (Choreographer, Grand Night for Singing) has worked in the Student Life Office at George Fox University as both a student and an employee. She has been involved in theatre and dance for most of her life, and is currently student teaching at Glencoe High School in drama and social studies. Michael O'Neil (Guest Director, Taming of the Shrew) received a BA in theatre from Castleton State College and was subsequently accepted into the world-renowned Ringling Bros. and Barnum & Bailey Clown College. Following a three-year touring stint with Ringling Bros., Michael furthered his education at the Dell 'Arte International School of Physical Theater in Blue Lake, Calif. He was then recruited by the Tears of Joy Puppet Theatre in Portland, Oregon, and for three years performed shows throughout the United States. Most recently, Michael has spent time creating, directing and performing original works throughout Europe, North America and Asia. He is the cofounder of the Nomadic Theatre Company in Portland, Oregon, and the producer of the Portland chapter of Clowns Without Borders, a nonprofit organization that provides entertainment to underprivileged communities throughout the world. Michael holds an MFA in directing from the University of Portland. Jan Powell (Guest Director, Steel Magnolias) is a scholar, coach, actor and freelance theatre director with a special interest in Shakespeare, music theatre, original work, and English-language classics. Most recently, she directed Marat/Sade at Theater 54 (Off-Off Broadway), and The Taming of the Shrew at Kingsmen Shakespeare in Los Angeles. As the former Artistic Director of the Lake Tahoe Shakespeare Festival, and Founding Artistic Director of the Tygres Heart Shakespeare Company (resident in the Portland Center for the Performing Arts), and past president of the Shakespeare Theatre Association, she has directed the entire canon of Shakespeare's histories. Regional theatre direction includes productions for the American Shakespeare Center, Mendocino Shakespeare Festival, San Francisco Shakespeare Festival, Boston's Stoneham Theatre, Nevada Repertory Theatre, Artists Repertory Theatre, Chamber Opera Oregon, Stark Raving Theatre, Portland Baroque Orchestra, and Third Angle New Music Ensemble. Ted Rooney (Adjunct Professor of Theatre) completed his undergraduate degree in theatre at Lewis & Clark College and received his MFA in acting at Temple University. After college, he played semi-pro basketball in Germany. Later, he moved to New York City for six years and Los Angeles for 10 years, pursuing theatre, commercial work and guest appearances on television. Some of Ted's favorite theatre roles include: "Don Quixote," "Uncle Vanya," "Charlie" in The Foreigner, "Malvolio," "Scrooge" and "Dogberry." He now lives, acts and teaches in his hometown, where he lives with his wife, Lori, and his two children, Abenezer and Bethlehem, who were both born in Ethiopia. Laurel Shultz (Costume Designer, She Loves Me) received her BA from Linfield College and her MFA in costume design from Boston University. At George Fox, Laurel is the costume shop manager and teaches costume design. She also works as a freelance designer in the Portland area and designed the costumes for George Fox's production of She Loves Me. Some of her other design credits include: A Midsummer Night's Dream and Two Gentlemen of Verona for Northwest Classical Theatre Company; Cosí Fan Tutte and Trumpery for Boston University and ART (American Repertory Theatre); and Cabaret for the Pacific Conservatory of the Performing Arts. Paul D. Streufert (Translator, Trojan Women and Ion) is the director of the Honors Program and associate professor of literature and languages at the University of Texas at Tylers. He holds a PhD in comparative literature from Purdue University, as MA in classics from Valparaiso University. His teaching and research focus on dramatic literature, particularly Athenian tragedy and its influences. Paul has translated three other tragedies of Euripedes for the stage, including Bakkhai, Iphigenia at Aulis, and The Trojan Women, performed at George Fox University in 2004. His text earned an honorary award from the Kennedy Center. 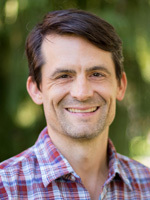 Brent Weaver (Composer, As You Like It) is an associate professor of music at George Fox University. He is an accomplished composer, singer, and teacher. His compositions have been featured on NPR and in concerts in the U.S., Europe and Latin America, and he has sung in concert and music theatre productions around the world. Among his theatrical music credits are music for Thornton Wilder's Our Town and a chamber opera on Edna St. Vincent Millay's one-act play Aria da Capo.